To read and/or download the original peer-reviewed article published in Archaeological Discovery, please click this link. The original English-language edition of Origins of the Sphinx (published by Inner Traditions, Rochester, Vermont, U.S.A.) was in print by the end of March 2017. In May of 2017, Robert Bauval and I participated in back-to-back conferences in California and Arizona. One of the attendees at the conferences was our colleague and friend, Dr. Manu Seyfzadeh (a dermatologist with a passion for ancient Egypt), who privately revealed to us an amazing discovery he had made: hieroglyphic evidence dating back to earliest dynastic times that apparently refers to the Great Sphinx and an archive under the Sphinx. At Dr. Seyfzadeh’s invitation, Robert Bauval and I joined him as coauthors on a scholarly paper describing this discovery which was, after being peer-reviewed, published in a journal devoted to archaeology (Manu Seyfzadeh, Robert M. Schoch, and Robert Bauval, 2017, “A New Interpretation of a Rare Old Kingdom Dual Title: The King’s Chief Librarian and Guardian of the Royal Archives of Mehit”, Archaeological Discovery, vol. 5, pp. 163-177). This new discovery, summarized here, reinforces the conclusion that the origins of the Great Sphinx date back to a remote time prior to dynastic Egypt (as John Anthony West and I have espoused since the early 1990s). The pharaoh (king) Khufu (Fourth Dynasty, middle 26th century BCE) is the traditional builder of the Great Pyramid. Khufu’s vizier (a high official) was a man named Hemiunu, a beautiful statue of whom was discovered on the Giza Plateau in 1912; this statue is now housed in the Roemer- und Pelizaeus-Museum, Hildesheim, Germany. As Dr. Seyfzadeh pointed out to Robert Bauval and me, on the base of the statue of Hemiunu there is a dual/tandem title that has eluded full translation by the Egyptological establishment. This tandem title is not an isolated instance; it is also found on a stunningly beautiful stele of the royal prince Wepemnefret, a son of Khufu who may have served as vizier following Hemiunu. Furthermore, this title goes back in time well before Khufu and the Fourth Dynasty, as it is also found on wooden panels of Hesy-Re (Hesy-Ra, or Hesire), a high official in the court of the pharaoh Djoser (middle or late 27th century BCE) of the Third Dynasty. Before I proceed, I want to make the point that this dual title is found associated with individuals who preceded the date generally attributed to the Great Sphinx by conventional Egyptologists, namely circa 2500 BCE, during the reign of the Fourth Dynasty pharaoh Khafre. Possibly Wepemnefret could have known Khafre during his lifetime, but without doubt Hesy-Re lived a century or more prior to the time of Khafre and the supposed construction of the Great Sphinx. 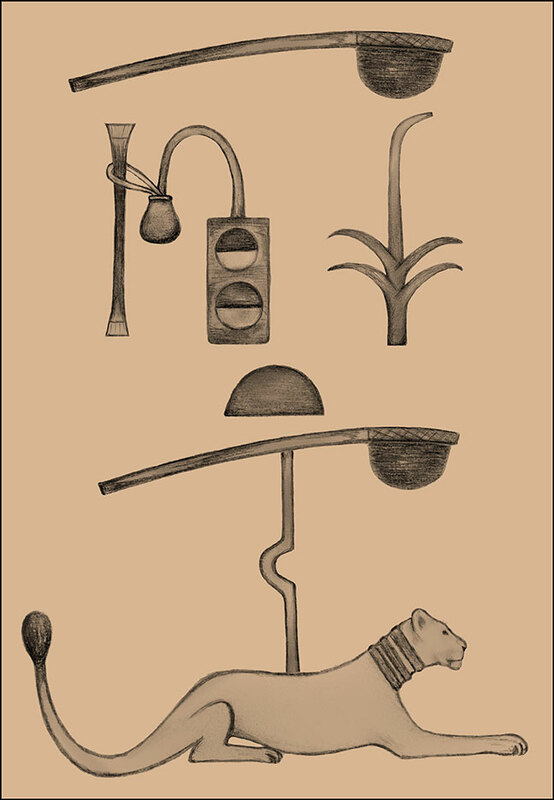 This tandem title consists of seven distinct signs or symbols, as recognized by Egyptologists, written in the following order: 1) Axe; 2) Reed and Inkwell, forming a single symbol; 3) Sedge (a plant found in Egypt); 4) Bread or Bread Loaf; 5) Axe; 6) Bent Rod (this is a mysterious, previously undeciphered, sign); and 7) Recumbent Lioness. Even taking stylistic differences due to the different sculptors into account, analogous to different fonts that can be used for our alphabetic letters, these hieroglyphic signs are virtually identical. At the base of the Hemiunu statue and on the Wepemnefret stela, the last three signs (axe, bent rod, lioness) are placed very close together, or are even touching. In the inscription on the wooden panels of Hesy-Re the vertical bent rod appears to touch the back of the lioness, as in the Hemiunu and Wepemnefret inscriptions, but the axe does not make actual contact with the bent rod. These slight differences are probably simply differences in artistic style and do not appear to be significant. The axe symbol is standardly translated along the lines of overseer, master, architect, master builder, or carpenter; that is, it denotes some sort of high official or person in charge of something of major importance. The fact that there are two axes indicates that this is a dual title; in the three examples noted above, associated with three different individuals, the two titles occur together. The reed and inkwell, sedge, and bread loaf associated with the first portion of the dual title have generally been translated to mean that the official holding this title was the overseer of the royal scribes and/or architects (the two are conceivably related, as architects would have to draw and record building plans and construction details) – an extremely important position, for such a person would be responsible for royal records and accounts, essential in governing the vast territory held by the pharaoh. But what could the second title represent? The axe of the second title is identical to that of the first, and thus presumably has the same meaning, that of an overseer or similar high official. But what is the apparent “bent rod” and what does the lioness represent? The lioness of this second title appears to be the same lioness represented elsewhere on the Wepemnefret stela, specifically in the name of the goddess Mehit (who could act as a protectress, taking the form of a female lion). Thus the Egyptologist William Stevenson Smith (1907-1969) translated this title as “Craftsman of Mehit” (Archaeology, March 1963, p. 12). But what is the strange “bent rod” protruding from, or entering into, the back of the lioness? This is a symbol that has eluded Egyptologists, in part due to its extreme rarity. It was neither listed nor translated by either Alan H. Gardiner (1879-1963) or E. A. Wallis Budge (1857-1934). More recently, some Egyptologists have associated the “bent rod” with a mooring post used in the docking of a boat, but this appears to be based simply on a superficial visual similarity to mooring posts and neither seems convincing nor makes sense in the context under consideration. I believe that Dr. Seyfzadeh solved the mystery of the “bent rod” by his suggestion that it represents a physical key that was used to open a lock. We know that by the Middle Kingdom (circa early second millennium BCE) the Egyptians had simple lock-and-key devices; now there is evidence that such devices go back to a much earlier period. Most likely, however, at such a very early date locks and keys were familiar to only the elite nobility, and thus references to or depictions of such devices appeared very rarely. Why would anyone stick a key in the back of a lioness? This makes no more sense than sticking a mooring post in her back, unless the lioness represents something else, such as a building or statue protecting a locked chamber or vault. Was the physical structure securing or protecting a locked vault in the shape of a lioness? Immediately the Great Sphinx comes to mind. But the Sphinx as we see it today has a lion’s body with a human head. However, the head was re-carved in dynastic times. Since my earliest studies of the Great Sphinx, I have suggested that originally the statue was a recumbent lion. And the locked chamber or vault associated with a lioness, as apparently indicated by the dual title? During the seismic work that Dr. Thomas Dobecki and I carried out around the Great Sphinx in the early 1990s, we located a chamber under the Sphinx in the vicinity of the left paw (see chapter 2 of Origins of the Sphinx). Now everything seemed to come together. The second portion of the dual title refers to an overseer, master, guardian, or possessor of a key that opened a vault that was, based on the first portion of the dual title (referring to scribes and records), an archive, a “Hall of Records”, guarded by a lioness. Furthermore, based on the striking similarity between Mehit (as shown on the Wepemnefret stela) and the lioness in the dual title, this guardian lioness is Mehit. In the real, physical, world one might suspect that the actual archive was located in the chamber under the Great Sphinx and, prior to the re-carving of its head, the Sphinx was a representation of the lioness Mehit. The dual title can be translated concretely as “Overseer of the Scribes of the King and Master of the Key to the Lioness” or, more fluently, as “The King’s Chief Librarian and Guardian of the Royal Archives of Mehit”. 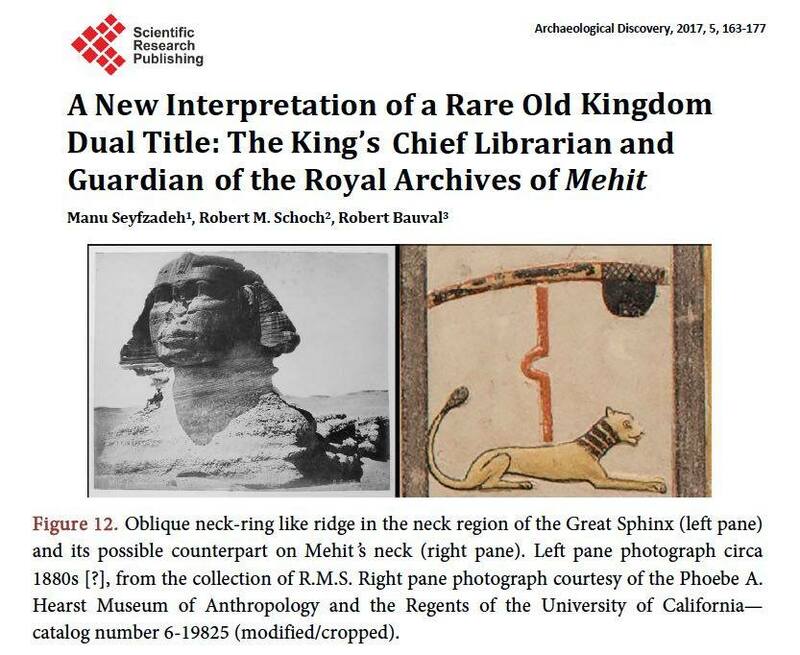 Were the “Royal Archives of Mehit” located on the Giza Plateau in a chamber under the Sphinx? The answer may lie in seal impressions of the First Dynasty pharaoh Djer (circa late 31st century BCE, some 500 years prior to Khufu). 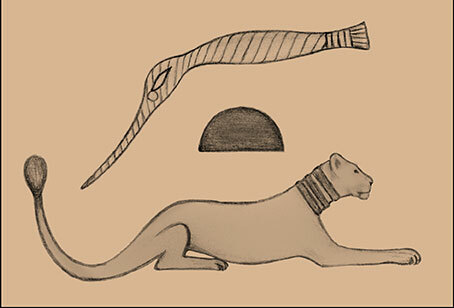 One of the seals records a lioness with three bent rods inserted into her back; the later single bent rod and lioness symbol may be a simplification of this earlier sign. It should also be pointed out that on the Djer seal the vertical bent rods explicitly touch, or are connected to, the lioness, as seems to be the case in the second portion of the dual/tandem title associated with Hemiunu, Wepemnefret, and Hesy-Re. This suggests that the vertical bent rod and lioness may have been viewed as a “tandem hieroglyph”, similar to a modern ligature where two or more letters may be joined together to form a single sign – such as “A” and “E” joined to form the ligature Æ. Also on the Djer seal there appears to be a chambered edifice or structure depicted (possibly representing something underground?) on top of which sits an animal, protecting it. This is highly reminiscent of the way the Great Sphinx is shown sitting upon or over an edifice more than a millennium and a half later on the famous “Dream Stela” erected by Thutmose IV (circa 1400 BCE) between the paws of the Sphinx (see the banner image at the top of this page). Furthermore, on the seal impression of Djer is found a symbol that may represent “ropes” or “stau”, the latter being a fragment of the name “Rostau”, which is how the ancient Egyptians referred to the Giza Plateau where the Sphinx is located (the plateau contains many underground caves and chambers, both artificial and natural, that could be accessed via ropes used to descend into them from ground level – hence the association of ropes and Rostau). Thus there is a strong case to be made that as early as the First Dynasty (when some of the first written records in Egypt were kept), the Sphinx – which at that time was a lioness named Mehit – existed on the Giza Plateau and guarded a locked chamber where archives were stored. How far back in time the proto-Sphinx goes, so far the written records do not tell us; however, the various analyses carried out by Robert Bauval and me suggest a date going back to at least the 11th millennium BCE. Such an extreme age is not contradicted by the hieroglyphic evidence that I have just discussed. Indeed, there is a hieroglyphic symbol that represents the forepart of a lion (sign “F4” in the standardized sign list compiled by Alan Gardiner; see the Archaeological Discovery article) that may have been inspired by the proto-Sphinx/lioness prior to the body being fully carved. This symbol may be the root of the ancient Egyptian word for “ancient” (that is, ancient to the Egyptians 4,000 to 5,000 or more years ago), which is in keeping with the proto-Sphinx (the original statue of the lioness Mehit) being extremely old indeed. The name of Mehit as written on the Wepemnefret stela consists of three signs, which have been interpreted by some Egyptologists as: 1) Coiled Rope or Whip; 2) Bread or Bread Loaf; and 3) Recumbent Lioness. Intriguingly, according to E. A. Wallis Budge, the name of Mehit can mean “A Uraeus [the sacred serpent or snake] on the brow of Ra [Re, the Egyptian god of the Sun]” (E. A. W. Budge, 1920, An Egyptian Hieroglyphic Dictionary in Two Volumes. London: John Murray). Thus, Mehit is associated with the Sun, and indeed throughout much of mythology around the world the Sun is represented by, or associated with, a lion (for instance, in classical Western astrology, the Sun is associated with and rules the zodiacal sign of the lion, Leo). Returning to Mehit, among other functions, in Egyptian mythology she was an enforcer of Ra’s will on Earth. According to Budge, the name and word Mehit also has the meaning of Rain or Flood – that is, a flood or floods caused by torrential rains. As we point out in the Archaeological Discovery paper, Mehit connects the idea of a solar lioness and the Sun with prehistoric (ancient to the ancient Egyptians) torrential rains and flooding. Why would the Sun and a solar lioness be associated with torrential rains and flooding? Based on the evidence, I believe this harkens back to the end of the last ice age (circa 9700 BCE) when a major solar outburst (or outbursts) snapped Earth out of its last ice age, concurrently melting glaciers and evaporating massive amounts of water that subsequently fell as torrential rains, causing widespread flooding (and in coastal areas exacerbated by the rise in sea levels at the end of the last ice age). This I discuss in my book Forgotten Civilization: The Role of Solar Outbursts in Our Past and Future (2012, Inner Traditions). I am convinced, based on the overwhelming evidence, as presented in both Forgotten Civilization and Origins of the Sphinx, that the original proto-Sphinx – which we can now demonstrate was the lioness Mehit – dates back to the 11th millennium BCE or earlier. 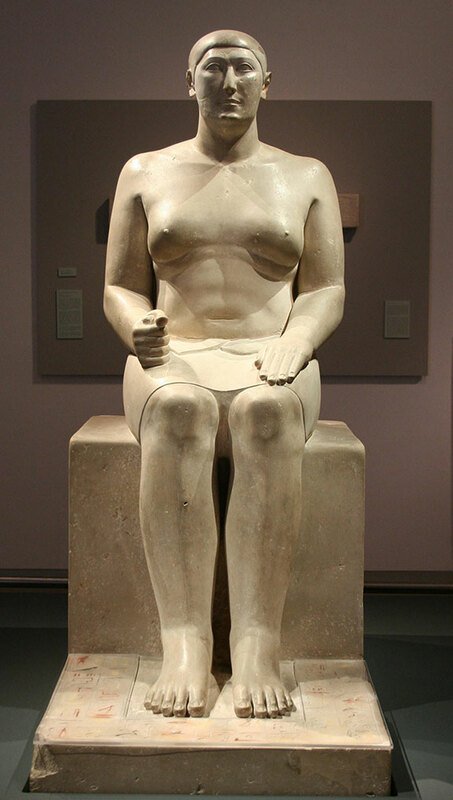 (Remember that the statue was not initially a Sphinx; the original head was re-carved in early dynastic times.) And why does the current Sphinx show evidence of extreme weathering and deep erosion due to rainfall? Because it was subjected to the torrential rains caused by the solar outburst that ended the last ice age. In the name of Mehit the ancient dynastic Egyptians encoded and memorialized the solar outburst and accompanying torrential rains of circa 9700 BCE. Furthermore, this occurred during the Age of Leo, at which time the proto-Sphinx, the lioness Mehit, faced the Sun located in the constellation of Leo as together the Sun and Leo rose in the sky on the morning of the vernal equinox. There is another provocative aspect of Mehit that I want to point out. In some of the depictions of the lioness she is shown wearing three or four ornamental neck-rings (these can be distinctly seen in the depictions of the lioness on Wepemnefret’s stela and the wood panel of Hesy-Re, but are absent from the depictions on Hemiunu’s statue and Djer’s seal). On the actual Great Sphinx an apparent “neck-ring” was also present up until very recent times, as best seen in nineteenth and early-twentieth century photos (it has since been obscured by modern repairs and reconstructions to the Sphinx). Possibly the original proto-Sphinx was carved with neck-rings, or possibly the apparent “neck-ring” observed on the Great Sphinx is a feature that developed due to weathering and erosion of the rock, which was then interpreted as a neck-ring by the dynastic Egyptians. Either way, the appearance of a “neck-ring” feature on the actual Great Sphinx and the depiction of neck-rings on the lioness Mehit further corroborates the association of these two entities – at one time the statue now known as the Great Sphinx took the form of the lioness Mehit. One final note: We dedicated the Archaeological Discovery article to John Anthony West (see chapter 7 of Origins of the Sphinx for the story of how our collaboration began), who, as I write, is bravely fighting Stage 4 cancer. Also, we re-designated the tandem hieroglyph that we reinterpreted, composed of the bent rod and the lioness, as the “J.A.W. Sign” in his honor. Left: John Anthony West in the Mena House, Cairo. Right: John Anthony West and Robert Schoch sitting together behind the Sphinx at sunrise. Photos taken July 2016 by Catherine Ulissey.